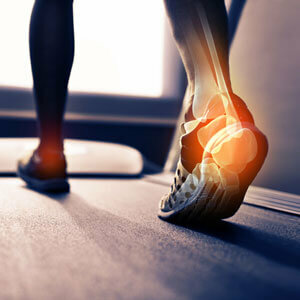 Heel pain is a common problem in those who take part in sport involving jumping or running. There are various structures that may be the cause of the symptoms you’re experiencing, however the most usual culprit is the plantar fascia. The plantar fascia is a large ligament (connective tissue) that connects the heel to the fore foot and supports the foot arch. The pain is caused by irritation and /or minor tearing of the fascia. It is often assumed that a heel spur is the cause of the problem, however we now know that heel spurs can be present without any pain. The pain with plantar fasciitis regularly comes on without an apparent cause and is felt deep within the heel. However it may be linked to and increase in training or a change in the type of training or the surface you train on. Pain is usually worst with the first few steps out of bed in the morning and eases with activity. Pain is aggravated by prolonged standing, walking or running, especially on hard surfaces. The first important step in managing your heel pain will be to replace the primary aggravating activity with low impact options to lessen the amount of stress being put on the heel and foot. This might involve reducing the length of your runs or switching to cycling or swimming until the symptoms are relieved. The condition and type of your running shoes may also contribute to the problem. Get your therapist to review this if you are at all worried about the age or supportiveness of your shoes. Treatment may include massage and stretching of the plantar fascia and the calf muscles. It is however important that a complete biomechanical evaluation is done, as we know that poor lower limb biomechanics and weakness in muscles of the hip and thigh increase the stress to the plantar fascia. There might likewise be a need for corrective orthotics or foot taping techniques, so as to allow you to return to your running program when possible, to help reduce the load in the fascia. Contact Synergy Healthcare to make your appointment.